I am still speechless about the above picture. I blinked and this happened. Inspire me Monday. Inspire me Tuesday. Tuesday at our house. The scoop. Made by you. Metamorphosis. You’re the star. Tuesday with a twist. Wonderful Wednesday. Wow us. Talk Of The town. Keep in touch. Beautifully made. Share your cup. Home and garden. Thursday favorites. Waste not. Dagmar’s house. Style showcase. Grandma’s DIY.Wednesday blog hop. Vintage charm. Friday features. Home sweet home. Feather nest.Friendship Friday. Funtastic Friday. Grace at home. Pit stop. Counting your blessings. Morning cup of joe. Home matters. Sweet inspiration. Best of the weekend. Create bake grow. Fresh market. Sunday at home. snickerdoodle. Happiness is homemade.Saturday shuffle. Silver pennies. Create with joy. Inspiration Monday. DI&DI. Amaze me. Over the moon. Like you, I’m crazy for glass. What a marvelous room, beautiful Chinese Chicken coop!! The glass is beautiful too. So much to love in your post! 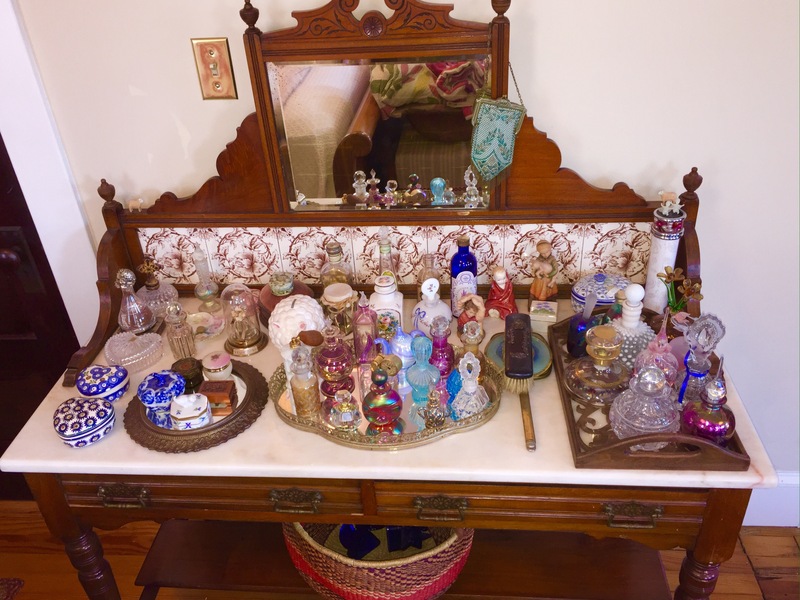 The quilts, the beautiful glass, the chicken coop….Wow! How smart you two are to have a Princess free room. Speaking of the Princess — they sure grow up fast!!!! Your bedroom is beautiful. It’s not easy to create a multi-cultural design and have it turn out this perfect. I think my favorite are the two chairs. You have done something here to be very proud of. Now you can relax and enjoy your summer with this adorable little sweetie pie. A week at the beach was wonderful. Summer has begun and relaxing can start. The quilts are amazing,reminds me of my grandmothers quilting days. My favorite are all the bottles in so many different shapes and colors. Thank you for sharing on Friday Features #omhgff this week!! I can’t pass up a quilt. I will always make room for more. Yes indeed, princess is growing up. 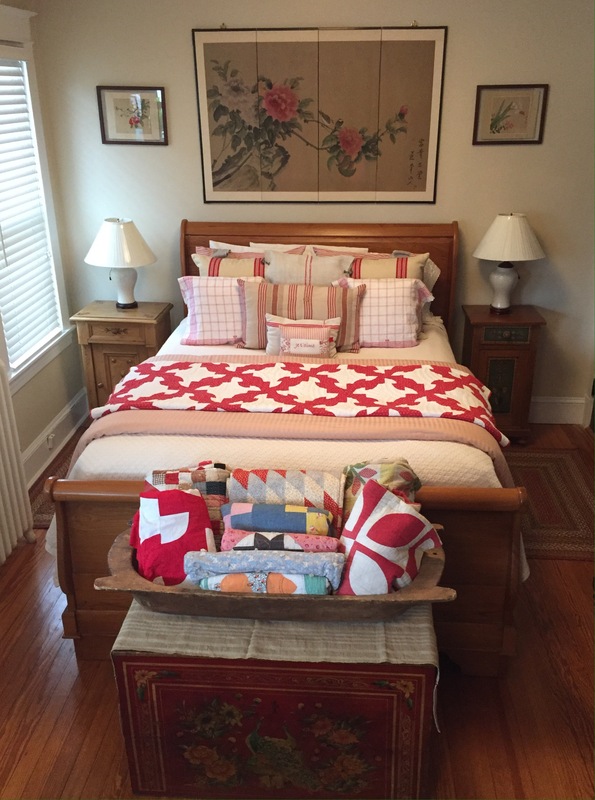 I love quilts and love how you have them displayed! Your glass collection is beautiful as well. Thanks for sharing with SYC. 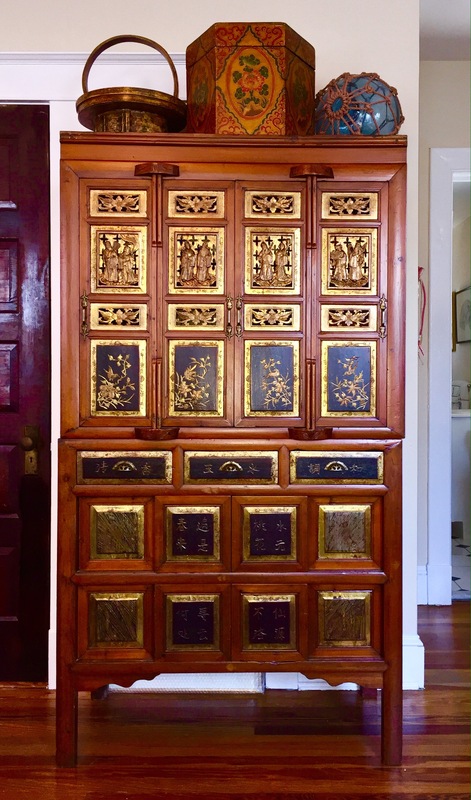 Love the cabinet! Such a beautiful smile on princess! My princesses are now adults with their own princes & princesses. It goes so quickly! Remember your welcome to drop by for a cup of inspiration! Nooooo, she’s getting big too quickly. It’s scary how time happens even when we’re not watching. One thing I would watch all the time though is that beautiful display of glass. What a lovely collection you both have. Stop stop Kindergarten…how can that be? Isn’t it great. I’m so lucky to have it. “I blinked, and this happened.” So true! What a lovely home for a lovely family! The days are long but the yeRs are short have never felt more true. I think I love this post ===most of all of yours! Every photo displays the love in your home and for family. I love your chicken coop. We don’t have a T.V. in our room either. I can’t believe Princess is finished with Pre-School. Thanks for linking to Keep In Touch. We have never missed one. I know Kindergarten is right around the corner. They do grow up quick. Thanks for sharing at Home Sweet Home. 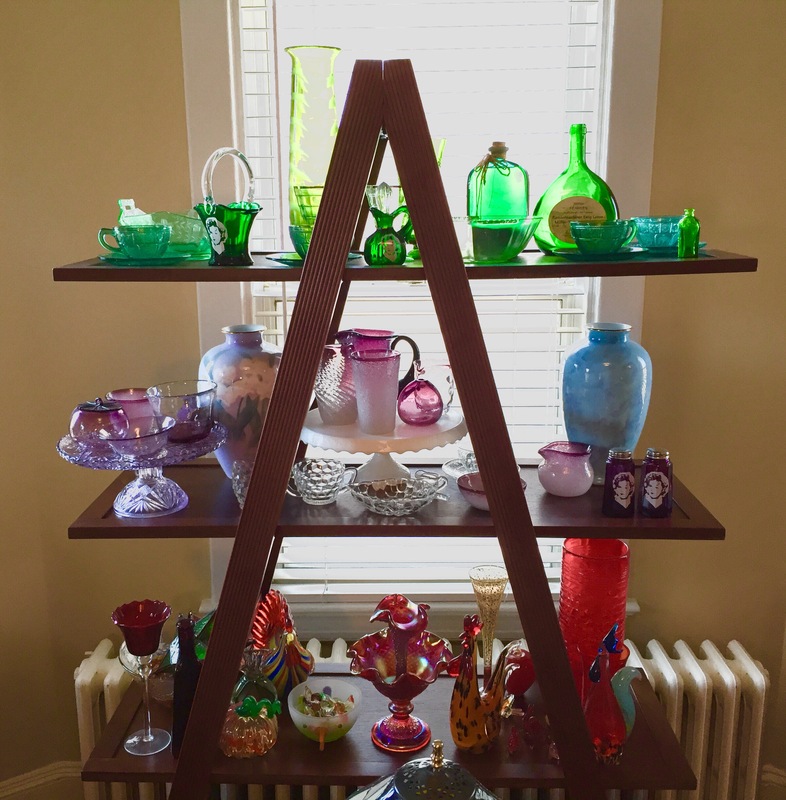 I just love colored glass collections! Such a pretty and relaxing bedroom. Thanks for sharing with us at the Summer Time Fun Linky Pinned. Thank you. Always a pleasure to visit your blog. 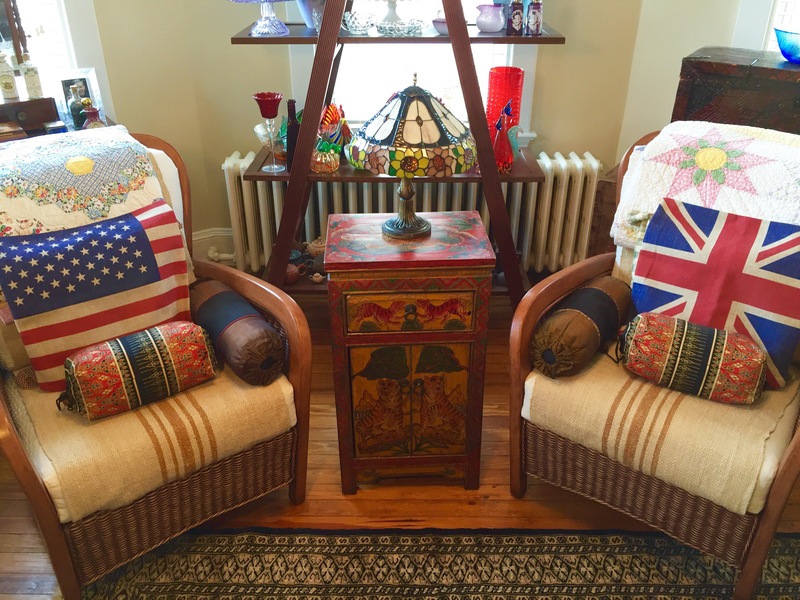 Thanks for sharing a bit of your home with us on the Summer Time Fun Link Party. I blinked and two of my kids are in college!